At About Time Aviation we're happy to provide competitive rates for all our services, offer a few 'extras', and make your experience with us as fun and memorable as possible. And since there are never any hidden fees, you always know exactly what to expect! All rates are for wet rental (fuel included) and there is no minimum daily amount. The best rate plan and block time discounts cannot be used for instructor's fees. Planes are available on a first come – first serve basis. 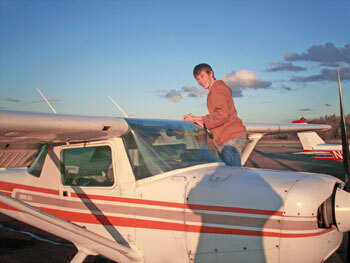 Best Rate Plan: This plan reduces the rental rate on EVERY aircraft in our fleet by $10 per hour. It costs $300 to join this plan. The money is non-refundable and the plan is in effect for one (1) year. At the end of the year, should you choose to renew your participation in the Best Rate Plan without interruption, the cost is $250 per year for the next year and every year thereafter without interruption. 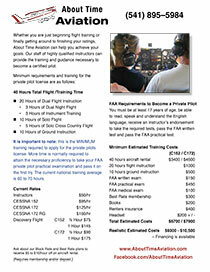 Block Time: This plan reduces the rental rate on EVERY aircraft in our fleet by $5 per hour. A deposit of $1500 is required for this plan. When the $1500 runs out another $1500 deposit is required to keep this plan active. There is a penalty if you decide to leave this plan before the $1500 runs out. The penalty consists of a $100 fee for early withdrawal plus all flight hours are recalculated at the full rate, not at the reduced rate. However, if you chose to go into the Best Rate Plan from this plan, there is no penalty. Need a plane? No problem! Every plane in our fleet is safe, well-maintained, and available on a first come, first served basis. Call our office at 541-895-5984 to reserve. No minimum fees for daily rental! 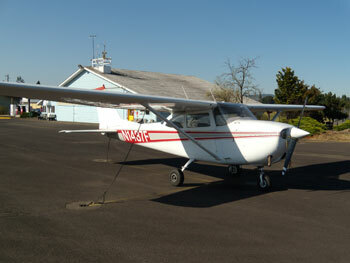 Pilot in command is required to provide proof of renter's insurance coverage. *If you have not flown an About Time Aviation airplane in the last (6) months, we require a dual flight with an instructor. Normally this takes less than an hour and mainly consists of a little pattern work. Instructor's and rental fees apply.